Radio Frequency (RF) has suitable use in telecommunication due to its wide range of frequency range. RF is electromagnetic radiation ranging from 30 Hz to 300 GHz. Various types of RF testing equipment are RF analyzers, RF filters, RF amplifiers and so on. There are many network analyzers based on this technology. Vector network analyzers are used to determine S-parameters of a myriad of passive components which includes cables, filters, switches, diplexers, duplexers, triplexers, couplers, bridges, attenuators, antennas, and many more. S-parameters provide broad understanding into the linear behavior of RF and microwave components. These are also used for characterization of the dielectric properties of any materials. The global market for RF testing equipment was estimated to be $4.94 billion in 2015 and is projected to escalate to $6.54 billion by 2021. 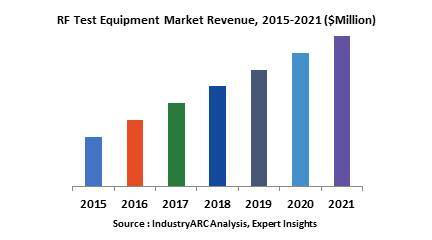 The RF testing equipment market has been broadly studied based on numerous differentiating parameters to provide a comprehensive overview. The market has been categorized on basis of product, application and geography. Further segregation into sub categories of these parameters is done to consider the dynamics associated with this industry. On basis of geography, the market has been fragmented into Americas, Europe, Asia-Pacific (APAC) and Rest of the World (RoW). Specific strategy was followed to search about the driving factors for RF testing equipment market in the eminent countries. The major driving factors accelerating the market are advancement in wireless technologies and rising demand for RF test equipment in aerospace and defense industry. In 2015, the market share for oscilloscope was 53.3% and is anticipated to grow at a CAGR of 4.26% during the forecast period. These companies with innovative product launches and large investment in R&D department have acquired global market shares. 11.18. Wireless Telecom Group, Inc.